Charge transfer mechanism proposed by Cravens, Res. Lett., 24, 105 (1997). Additional X rays seen from minor ions (O, C, Fe, Si, Ne, N) make up ~0.1%. As charge transfer efficiently produces excited states of highly charged ions this model reproduces observed intensities. 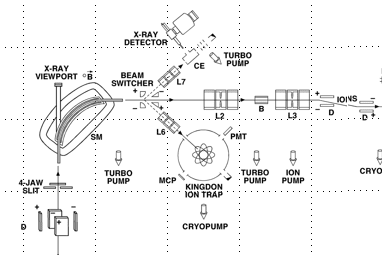 From 1989 to 2007 I was involved at JPL/Caltech with an experimental setup where we have/had a 2 keV to 10 keV times charge state ion beam produced by an Electron Cyclotron Resonance Ion Source (ECRIS). The highly charged ions produced (eg. O+6, Fe+13, Si+3 ) enter a vacuum chamber target region and are observed colliding in a (gas or solid) cell, and emitting soft x-ray to VUV spectral lines. A McPherson grazing incidence vacuum grade ultraviolet VUV monochrometer is used to analyze the photon signal at particular wavelengths from 5 nm to 400 nm. The PM tube will be used to pick up the photons within the wavelength limits of a MgFl2 or quartz window. The HV and Amplifier is placed outside the vacuum. I also plan later to use a UV (and in vacuum grade) CCD camera from Andor, Photonics or Hamamatsu, depending on cost. The CCD will allow multiple wavelengths to be sampled simultaneously. Partially assembled system consisting of Norcal vacuum bell jar collar feedthrough located in BHSN Room 322 as of July 2017 and typical rack controller layout. We have obtained vacuum pressures of 2×10-7 Torr thus far summer of 2017. This planned IWU research is somewhat a continuation of research I was doing while at JPL/Caltech from 1989 to 2007. Shown below is a layout of that facility for reference purpose. 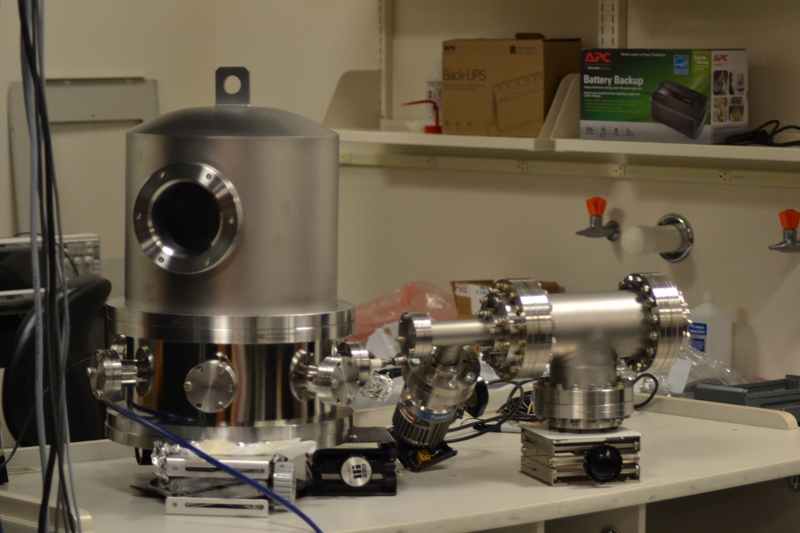 We are setting up an ionizer and x-ray detector here at IWU to perform similar measurements of X-ray fluorescence. 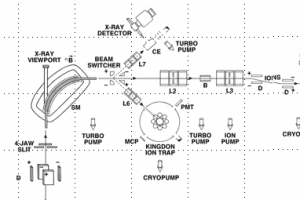 Ions will come from a commercial “glow discharge” ion source, called the “Colutron” as well as custom ion beam sources produced from “cold cathode” and even nano-spray ion injector systems Steven Smith has developed. 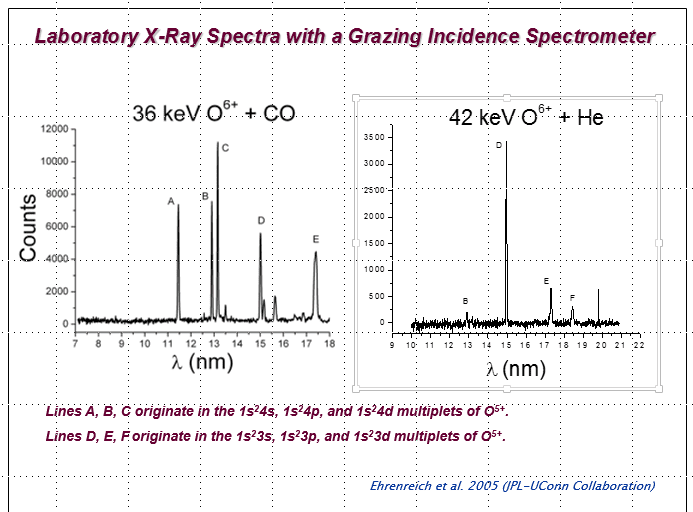 Shown below is a plot of X-ray Spectra obtain from a 36 keV Oxygen source impacting CO gas molecules, as well as 42 keV O6+ impacting on a Helium gas target. I was Principal Investigator on a NASA code S Astrophysics program dealing with measuring metastable lifetimes of highly charged ions. Ions produced by the ECR are trapped in an electrostatic Kingdon trap operating at ultrahigh vacuum We have published results for C+, O+2, and another publications for Fe+9,Fe+10 and Fe+13. 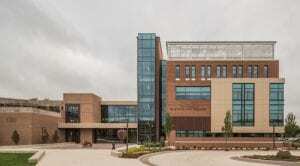 We are now in the process of building up this type of system at IWU. Ions are produced by a commercial Ions source called a “Colutron” and filtered through a velocity “Wien” filter. Our main target vacuum chamber was setup summer 2017 and is built around Norcal commercial vacuum chamber. We have thus far obtained vacuums on the order of 2x 10-7 Torr inside the Bell Jar chamber. The ions produced by this system will be accelerated to kilo-electron volt energies and impinge on a gas or solid target. 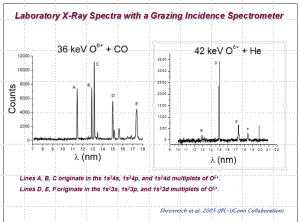 The x-rays produced in these x –ray fluorescence interactions are then energy /wavelength analyzed by a commercial McPherson Grazing Incidence soft x-ray Monochromator. I have been a lifelong amateur astronomer, and am well versed with practical nighttime observing sessions. I have conducted a number of public outreach sessions through the JPL Astronomy club and various JPL public relations outreach programs. In these sessions, the general public was invited for a lecture/slide show and then a viewing session through a number of JPL and Caltech portable telescopes. These 8-14″ instruments were used for example to view several bright comets, the Mercury (daytime) solar transit, and most recent close opposition of Mars. I have also performed local “Star Parties” at the Marion Indiana Public Library and the Indiana DNR Mississiniwa Reservoir for the Boy Scouts I personally own and use a number of telescopes, including an 8″ f8 Newtonian and a 6″ instrument. I have constructed various optical setups both visual (astronomy) and bench top laser applications. 27. “Measurement of the Metastable Lifetime for the 2s22p2 1S0 Level in O2+,” Smith, S. J., Cadez, I., Chutjian, A., and Niimura, M., Ap. J. (Astrophysics Journal) 602, 1075 (2004). “Surface Charging and X-Ra Emission from Insulator Surfaces Induced by Collisions with Highly Charged Ions: Relevance to Cometary Spectroscopy”, N. Djuric, J. A. Lozano, S.J.Smith, and A. Chutjian. Ap. J. 636, 718 (2006). “Measurement of Absolute Cross Sections for Excitation of the 2s2 1S – 2s2p 1Po Transition in O+4”, S.J. Smith, N. Djuric, J. A. Lozano, K.A. Berrington, and A. Chutjian, J. 630 1210 (2005). 35. Absolute Single and Multiple Charge Exchange Cross Sections for Highly Charged C, N, and O Ions Colliding with CH4 “,N. Djurić, S. J. Smith, J. Simcic, and A. Chutjian, Ap. J. 679 No. 2 1661 (2008).